The Islands as well as being blessed with wonderful scenery also have lots of wildlife. I did two wildlife shoots both of the birds that come to the island. The intention was to shoot surf birds and I also wanted to capture a Puffin. I had tried to photograph Puffins before on the trip to Harris a couple of years ago, and while I managed a few shots, of them in flight from on deck of a ship the photographs show mainly blurred specks in the distance. 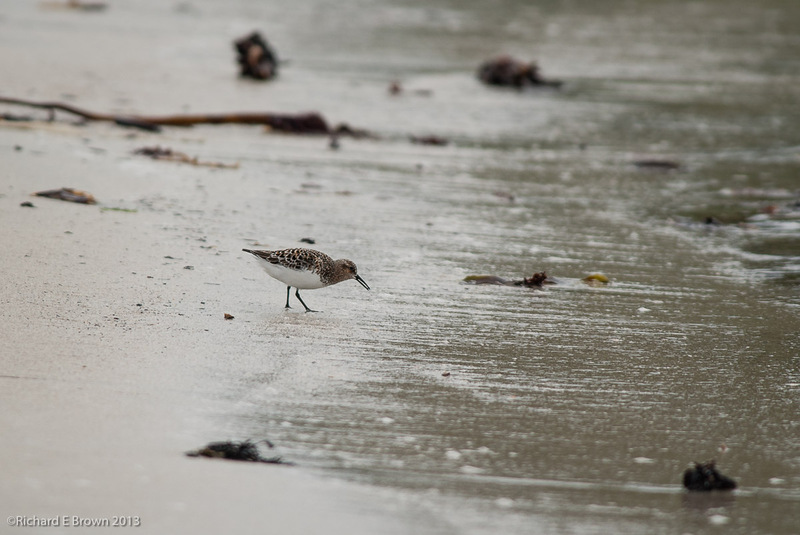 After shooting the remains of a Viking Hall on the main Island I headed to the nearby beach where I had spotted a number of small birds feeding on the beach. 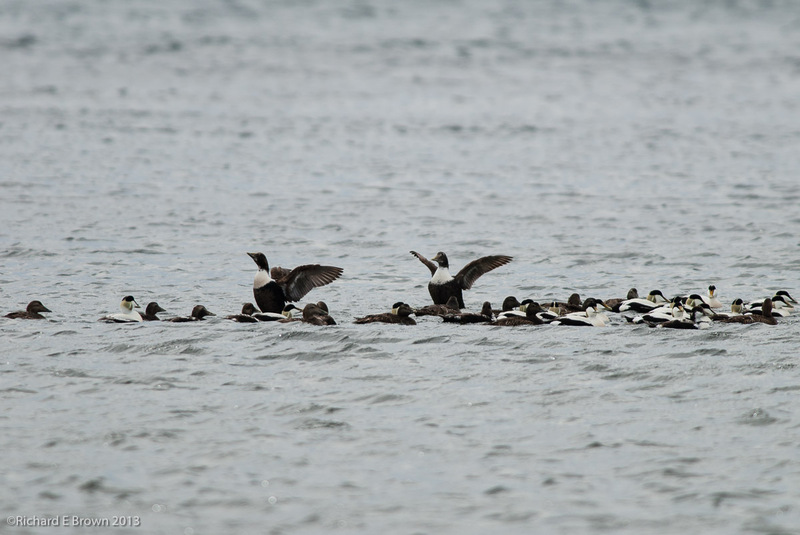 The tide was going back out and the number of birds feeding on the beach had reduced but there was now some Eider Ducks swimming and feeding just offshore. I setup on the beach with the Nikon D200 DSLR and my longest lens and waited. 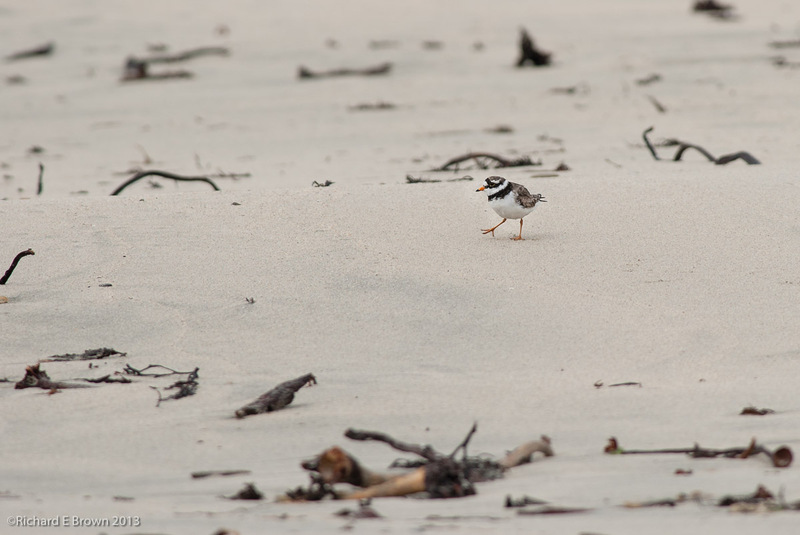 Walking onto the beach had scared away most of the birds but it was not long before a few started to come back. Once they started to feed I kept moving forwards, when they stopped feeding I would stop and wait. It did not take long before they started to feed again, and once again I would move forward some more. Its challenging photography and needs time and patience but one can get some rewarding images. What I learnt from this session is that its better to photograph on an incoming tide then outgoing. For the second wildlife photography session I was intent on capturing the Puffins. The best place was the southern cliffs next to the lighthouse on the main island. There is a car park nearby but its still a good walk to the top of cliffs. The RSPB have a notice board showing what species have been scene recently. One surprise entry was that a pod of Orca had swam past the southern tip of the island the previous Friday. We climbed to the top and setup; there was lots of nesting birds but no Puffin’s in sight. 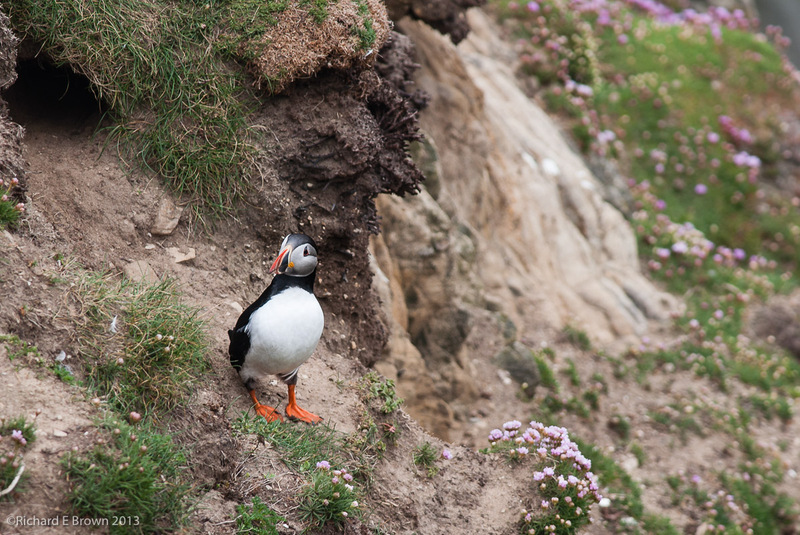 After a short wait a Puffin eventually emerged from one of the many holes in the cliff side. 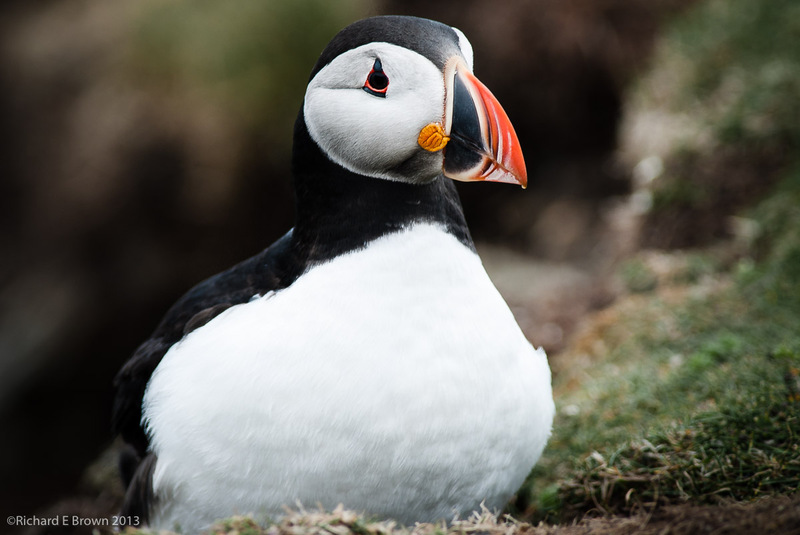 It was one of the cooler days we had experienced on the island and most of the Puffins seemed to want to stay in their underground burrows, but as the sun came out so did the Puffins and I managed to get some good shots of them emerging from their burrows. 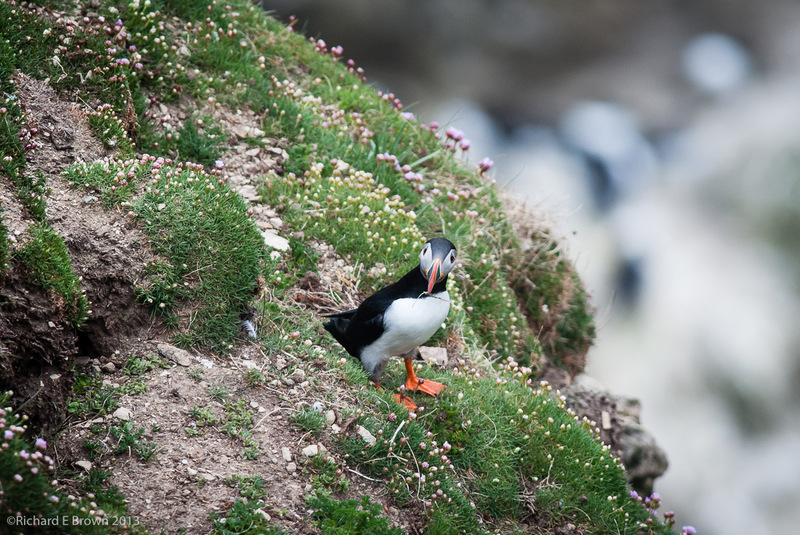 As you can see from the above photographs I finally managed to get some pleasing photographs of Puffins.